Mayawati Says PM Modi's Interview "Focussed Only Around His Party"
Mayawati said that the ruling Bharatiya Janata Party (BJP) still believed that its arrogance over the majority it enjoys at present is correct and justified. BSP chief Mayawati on Wednesday said that Prime Minister Narendra Modi's media interview on the New Year Day was a lacklustre one, as it did not focus on the burning issues facing the nation and was instead "focussed only around his party and the government". In a statement issued by the Bahujan Samaj Party (BSP), the four-time Uttar Pradesh Chief Minister said that the interview also failed to kindle any hopes in the new year. These wrong policies and arrogance have done no good to the country and its people in the past nor will do any in the future, the Dalit leader stated. She said that the ruling Bharatiya Janata Party (BJP) still believed that its arrogance over the majority it enjoys at present is correct and justified. "The BJP still thinks that people are happy with every decision they make and are clapping for them.... Having lost its state governments in Madhya Pradesh, Rajasthan and Chhattisgarh recently, it is now taking pride by saying that its vote percentage was more or at par with Congress," she said. The former Uttar Pradesh Chief Minister said that this kind of arrogance will perhaps go only after the general elections of 2019 when it would be booted out by the people. She also pointed out how many of the NDA allies had broken ranks with the BJP and the existing ones were pained and feeling humiliated by the party's arrogance. She alleged that be it black money, depositing Rs 15 lakh in banks accounts of poor people or job creation, the BJP has not been able to fulfil any of its election promises of 2014 and was only creating unrest on the issues of cow protection and Ayodhya. 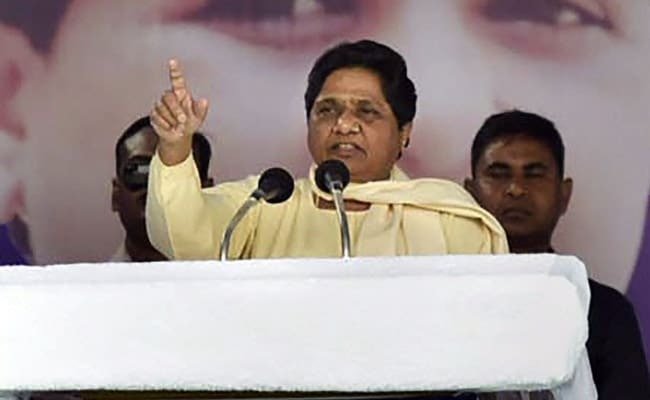 Mayawati also questioned the cabinet decision of the Yogi Adityanath-led state government to levy cess for cow protection and said that if the BJP and its ideological mentor are serious on this issue, a national law should be formulated.